Even more important to 18th c. notions of cleanliness was clean linen. According to medical beliefs of the time, perspiration was considered one of the body's important ways of "evacuating" ills, and a shirt made of linen, a naturally absorbent fibre, would contribute to good health. Linen shirts were an indispensable part of the male wardrobe and the only garment worn directly against the skin, and having a clean shirt was a literal sign of clean living. But like many things that begin with good reasons, fashion soon took over. Men were judged not only on the quality and cleanliness of their linen, but also how often they changed those linen shirts. As this passage from Daniel Defoe's The Complete English Tradesman (1728) shows, while cleanliness and clean linen was to be praised, excessive amounts of it weren't – at least not to him. The universal custom of wearing excessive fine linen; not a shopkeeper, not a drawer at a tavern, not a barber, not hardly a barber's prentice, but must have a shirt of fine holland of five or six shillings per ell; and the ordinary beaus run it up to ten or twelve shillings an ell. Their grandfathers perhaps as clean, though not so gay [fashion-conscious], contented themselves with good holland of less than half the price, and with shifting their linen perhaps twice a week; to correct which, our nicer gentlemen have brought it to two clean shirts a day; we may suppose their uncleaner bodies require it more than those of their ancestors did. More about 18th c. men's shirts here and here. Thanks to Sarah Woodyard, apprentice mantua-maker, Historic Trades Program, Colonial Williamsburg for her assistance with this post. 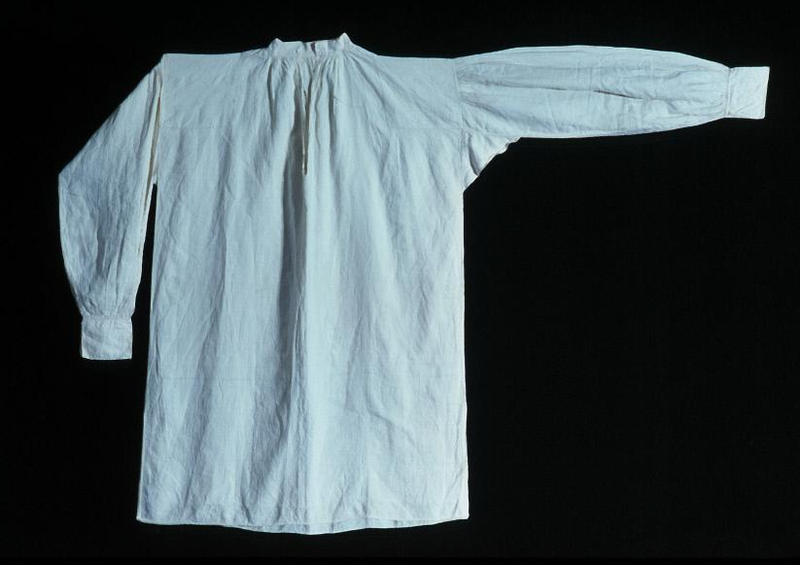 Above: Man's linen shirt, 1775-1790 (remodeled 1810-1820), American or English. Colonial Williamsburg. Fascinating article ladies! You can still find 19thc/early 20thc French linen shirts. Some are indeed slashed at the neck, but some do have buttons, often mother-of-pearl. The story goes that the shirts were so rough at first, the rich farmers would get their labourers to wear them a few times to soften. Cotton collars were sometimes added too for the same reason. But, the added seam gussets are still there, the gathers or pleats on the shoulders, the monogramme - and the mid-thigh length! In the hot, humid weather we've been having, that loose linen shirt looks very appealing. I wouldn't mind having one myself. It looks as if it would make a great summer dress! It's always so nice to read that yes, people did wash themselves in the 18th century. The standards were a bit different, though. :) Anotehr reason to wash, that I think we modern people tend to forget, is to get rid of vermin. I have found several recipes for getting rid of lice and such and many are just washing the body with an ointment which is usually some kinds of scented water. Thanks, I didn't know of the twice a day fashion, but I did read in Lucy Worsley's book If Walls Could Talk of the perspiration theory you mentioned.